Angelo David Pisacreta launched Hair Detox and VOL Volumizing Trio at Angelo David Salon this past November. Hair Detox is an all-natural herbal supplement for healthy hair, skin and nails. It gently detoxifies the body from the inside out, to help restore its natural ability to grow fuller, stronger and healthier hair. As part of the Angelo David Hair Care Collection, the VOL Volumizing Trio features the VOL Volumizing Shampoo, Conditioner and Volumizing Spray. Angelo David's VOL Volumizing Spray transforms fine, limp hair by adding incredible fullness and volume without creating stiffness. Its flexible-conditioning formula combines silk and wheat proteins with Panthenol and avocado for extra strength and hydration while Evening Primrose enhances shine. VOL Volumizing Spray is easy to use: mist evenly on towel-dried hair, lift sections and direct spray from the roots to the mid-shaft and style hair as desired. For extra volume, set with your blow dryer. Hair Detox (available at hairdetox.com), VOL Shampoo, Conditioner and Volumizing Spray are currently available for purchase exclusively at Angelo David Salon in NYC and online at angelodavid.com. $1 of every purchase of VOL Volumizing Spray is being donated to Lupus Research. 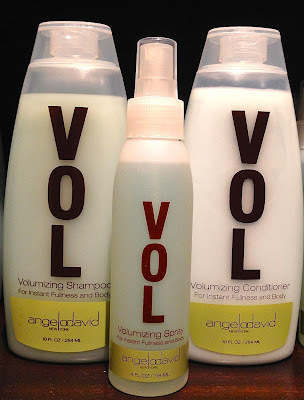 I look forward to starting off 2014 with the VOL Volumizing Trio!